On the roof of The Print House, a former factory for catalogues, crayons and pencils, sits Dalston Roof Park, an urban oasis four floors up over looking London's skyline. Open from May to October, the outdoor terrace has been refurbished for 2019 with a new look - best described as "sunset all night long" - and a brand new second bar and patio seating area. It's the perfect place to enjoy food from 'Far Out Food', who return for their second year, and cool drinks by in-house brewery, 40ft, whose pale ale, Factor 40, is made exclusively for the venue. Neighbours, Newcomer Wines, are curating a low intervention Natural wine list while events bring renowned DJs, musicians and record labels to the rooftop. A monthly free entry series with Phonica Records is just one of the collaborations to enjoy. In between you can expect laid back poetry, cinema, karaoke and quiz nights. Soak it all up, happy in the knowledge that all proceeds go towards supporting Bootstrap's charitable aims, helping to provide affordable working spaces and enterprise support. 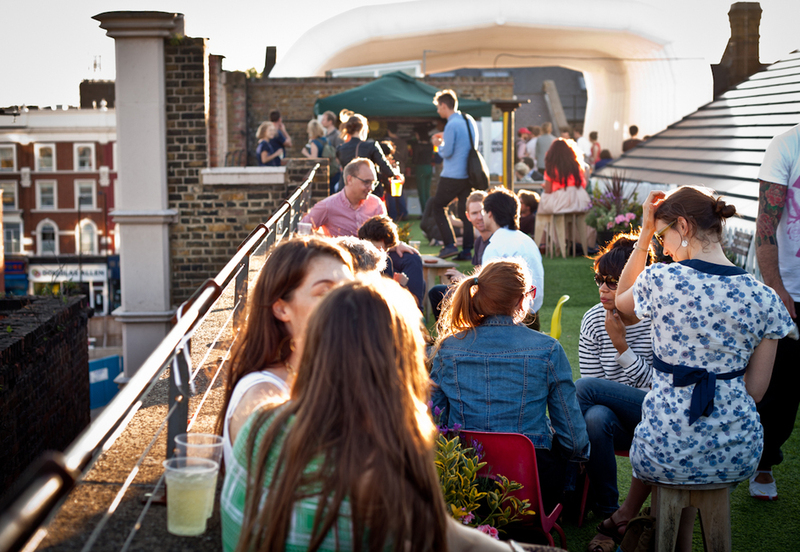 Dalston Roof Park clubs, bars, cabaret nights, casinos and interesting nightlife. What are the best dining options near Dalston Roof Park London? Dalston Roof Park gyms, sporting activities, health & beauty and fitness. The best pubs near London Dalston Roof Park. Where to have your meeting, conference, exhibition, private dining or training course near Dalston Roof Park. From cheap budget places to stay to luxury 5 star hotels see our discounts for Dalston Roof Park hotels, including Town Hall Hotel & Apartments from 77% off.